Along with Exchange OST Offline Emails to TIFF, the tool convert OST files in more than seven file formats. Single File Mode:- Using the single mode, you can add one file at a time. Find Option:- With this option, you can select a number of email file types. Click on the Search button. After adding the selected files software starts scanning them with details like; Collection Name, Created On, etc., Select the email which you want to export from OST to TIFF Images and click on export. For converting multiple folders, use the Export option from the navigation bar. 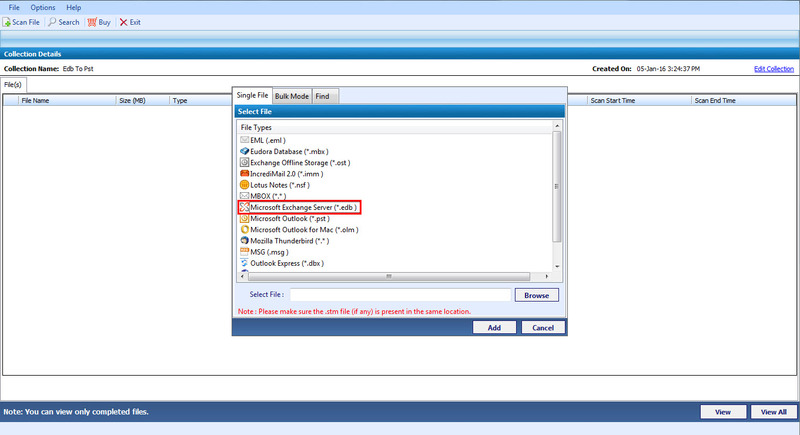 I have configured the MS outlook with an exchange server in cached exchange mode. It creates the OST file in a result, which can only be open offline on which the Ms outlook installs but if you want to access that ost file in other accounts then you can’t do this. I have got some emails from the client which requires to seen by company general manager. But the problem is that manager is on the vacation and he did not carry his laptop. I discuss the situation with him then he asks that send the images of emails. From then I am looking for the solution to convert ost files to images. Can I perform the bulk conversion of OST files to TIFF? Is there any option to search for specific ost file? Does software capable of locating the ost file automatically? Will Software convert each ost emails to single tiff image? OST to TIFF Converter is the best software to tackle a unique problem. It has the collection of refined features which helps you to resolve your problem in the simple and convenient manner with ease. It allows you to perform the bulk conversion of ost files to tiff. With Advanced search option, you can search your desired emails. It automatically browses the file from the local storage. It is the default feature of software to create single TIFF for each nsf emails with attachments. Do I need to install Outlook 2013 to access the OST files? What is maximum size of the OST that can be converted using the tool? You can convert OST files of any size using the converter. Size of files does not limits the conversion capability of the tool. Can I view the JPEG image attached with emails? The OST to TIFF conversion tool is an excellent tool to migrate OST files to TIFF documents. The most attractive feature of this tool is the custom naming convention equipped with the tool. This helped me to identify the file form the name itself. Great work! This helped me to convert my 1000+ OST emails to the TIFF documents. So that now I can access the important emails from any platform.I'm extremely tankful to the team for the excellent work 'OST to TIFF Converter'. Good job! To convert Outlook OST offline file to TIFF, no manual methods are available. To achieve this task you will need the help of third party tool like OST to TIFF Converter. It is widely used by the experts to perform the bulk conversion of OST emails to TIFF. It includes the features like the custom naming option, power search option, 9+ preview modes to analyze Outlook OST file. Apart from this the tool has the capability to convert Outlook OST file to other file formats as well such as PST, EML, MSG etc.